Everbuild - A thin solvent based liquid which removes wet paint quickly from brushes, rollers and pads. 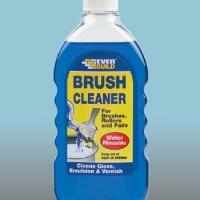 Works on emulsion spirit based paints, varnish and is water washable. Contains conditioner to prolong brush/roller life.